I’m going to let you in on a little secret….Without my morning cup of coffee, I wouldn’t be able to go through a busy day. It’s partly because of the caffeine we all need to give us a head start on each day, but it’s about more than just that. There’s a ritual in making a ﻿fresh﻿ cup of coffee each morning. Once you get into it - you start looking for the best pour over coffee maker out there and for the best brew you could find. I try to always keep in mind that one is connected with the other because the purpose of the pour over coffee maker is to leave you with the purest and most unfiltered flavor of coffee. This is a back to basics approach to coffee making, and it’s what true coffee lovers need to make their mornings perfect. 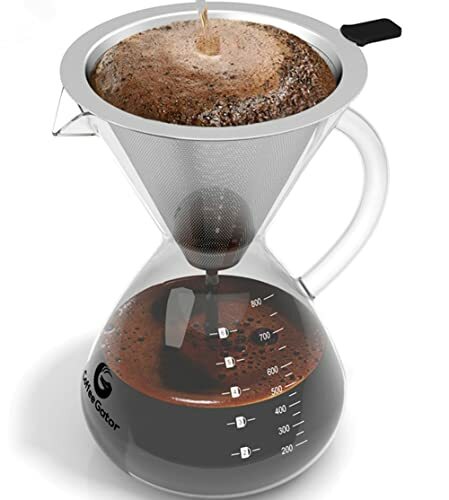 What To Look For In A Pour Over Coffee Maker? 1. Where Will You Brew? 3. What’s Your Skill Level? There’s a whole world of pour over coffee makers out there, and choosing a perfect one could take a while, depending on how much you know about coffee and how important is the process for you. However, there’s one thing that needs to be said upfront. A grinder is a more valuable tool for making coffee than the ﻿﻿﻿﻿coffee﻿﻿ maker. Any barista would agree that having a ceramic burr grinder makes more of a difference in terms of taste and aroma than any coffee maker ever could, regardless of its quality. Now when we have that settles, we can move on to the topic at hand. I’m not exactly a morning person, and things can get a bit hectic in our household before 8 PM. That’s why I often make coffee on the go while juggling a few other tasks in the process. The coffee maker of your choice needs to be built to withstand this sort of tasks. That’s why you need to choose the maker that’s best suited to the way you’re planning to use it. 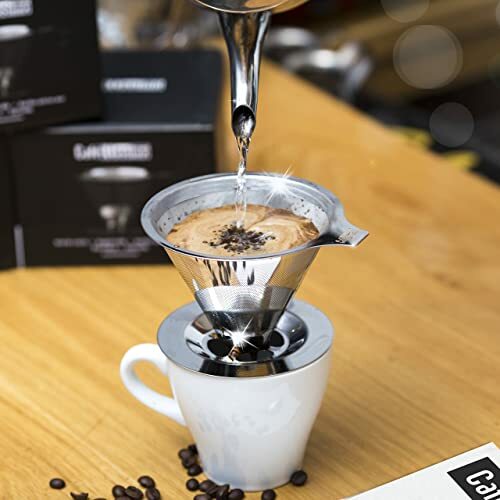 If you’re like me, plastic or metal pour-overs are your thing. On the other hand, if you don’t plan to move the pour-over a lot (and definitely not intend to travel with it) maybe you should get something ceramic and more fragile. There are no universal answers as to what coffee maker is the best. There are too many factors involved in choosing one. It helps if you know what kind of morning routine you have and how your kitchen is organized. Patience is a key element of making a good cup of coffee. It takes about 5 minutes to prepare the brew, which includes measuring, grinding and boiling the water. The next step is determined by the pour-over you buy is think carefully of how long can you spend on making coffee each morning. Remember, that sometimes having more time for yourself isn’t a bad thing. Pour-over rally on manual brewing style which means that experience and training means a lot in terms of quality and speed of coffee making. There are a lot of variables that go into giving the coffee that distinctive kick and smell – the temperature of the water, the aggressiveness of the pour, and the weight of the grounds all make a difference a trained coffee drinker would notice right away. The type of coffee maker is also a factor and the biggest concern when getting one should be how easy it to customize the brew is. Novices should stick to the coffee maker that always gives the same results, while those with more experience have the luxury of experimenting. Once you’ve chosen the perfect pour-over, you could start thinking about the bells and whistles. These additional features and equipment aren’t exactly necessary (meaning that the coffee could be made even without them), but you’ll soon see that they make a difference. I also enjoy the feeling of having professional equipment at my disposal at all times. The best place to start is with specialized filters, depending on the grinds you use. You’ll also need a set of scales and a good gooseneck kettle. Separate this equipment into to two categories: one is there just to make the brewing more convenient (like the scales) while the other will affect the quality of the coffee. Make your priorities based on that. Have in mind that this additional equipment could set you back quite a lot. Depending on the manufacturer and the quality of materials you use, the price could be as much as three times higher than it would without it. Of course, you don’t need to buy everything at once; there’s a thrill in getting new skills and finding the equipment to match it. Cleanliness is one of the things that often gets forgotten, and it definitely shouldn’t be. It’s important to keep the coffee maker clean and to remove any coffee oils that might have left after each brew. The ease of cleaning is among my top priorities when buying a new pour-over. The size of the grinds is also a crucial factor when it comes to richness of the taste and the aroma of the coffee. Have in mind that you might have a favorite brew now, but you might want to experiment further as time goes by. There are a lot of resources online, as well as real life support groups and communities that could help you get into coffee brewing and help you select the best coffee maker for your needs and tastes. However, there’s nothing like trying it for yourself and deciding what you like based on actual personal experience. Coffee Gator is made out of the firm and versatile materials and has a compact design. This makes it beautiful to look at and show off to your friends, but more importantly, it means that you could use it on the go and travel with it if necessary. How fast you want to make your coffee isn’t entirely up to the coffee maker, you’ll also have to think about the quality of the grind. A finer grind will mean you have to wait a bit longer. On the plus side, Gator is quite easy to clean and put together, especially because of the thermometer that allows you to do other things around the kitchen while you wait for the coffee. It comes with all the additional equipment you might need including glass carafe and a steel filter. Have in mind that this couldn’t be placed in the microwave, meaning that you’ll have to heat the water separately. The main drawbacks are the fact the glass carafe could break if you drop it and you need to pre-warm the water if you want a really hot cup of coffee in the morning (and I know I do). The temperature gauge in the lid is a really useful feature. The precise spout is an improvement and it makes things nice and neat in your kitchen. 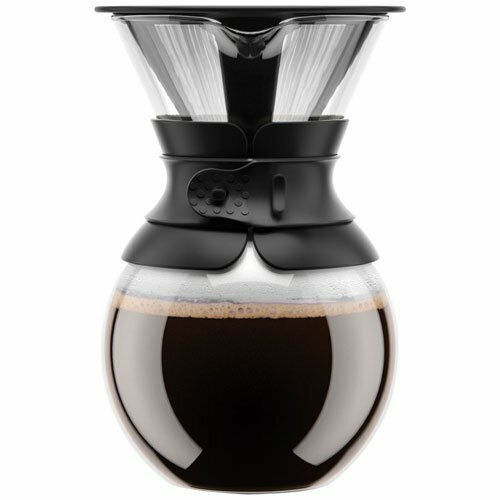 The Bodum comes in an hourglass shape with plastic all over the edges, which is a great feature if you want to carry it around with you to work or a shorter trip. It also, looks great in the kitchen since it’s minimalistic and comes in a lot of different colors. It’s both for those who are in a hurry and those who take pride in their equipment and kitchen. When it comes to the time needed to actually enjoy a hot cup of coffee, the Bodum is one of the best solutions out there. It heats the water to a perfect temperature and the whole process never lasts more than 3 minutes. It is fast, but it has a gentle flow, meaning that there won’t be those little divots most coffee makers leave behind. It’s a perfect machine for beginners because it’s so quick and easy to use – anyone could do it. You could play around with stirring and mixing the grinds but you’ll get a pretty consistent taste every time. The carafe is made out of heat–resistant glass which means that even a complete novice could use it and not be afraid of getting burned. 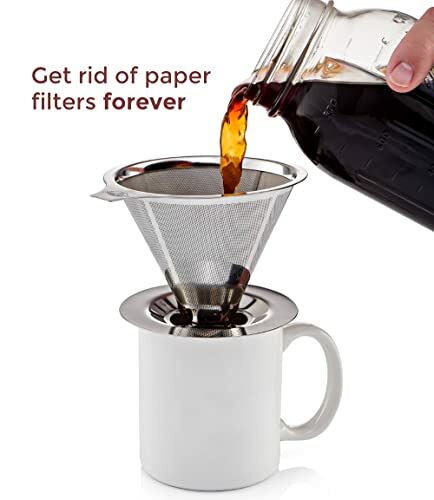 The only problem with it is that the filter basket can’t stand on its own on the table which is why most reviews say that they felt like they are going to spill the grinds when pouring them. The design is just gorges and it’s made out of durable materials as well. It’s simple and easy to use and clean. All the additional equipment isn’t really that necessary for novice coffee makers and it adds to the price. You can’t use disposable filters with this one. This coffee maker is small and compact. It’s made of very durable materials (dual mesh of stainless steel). With it, you can brew a great cup of coffee in your kitchen, on the road or even in a bar or a café. It is, however, better suited to those who like a richer taste and flavor. There’s absolutely no additional equipment needed since Caffelisimo offers everything you might need in its simple and compact design. No paper filters also mean that you’ll have to do much less cleaning. It’s a professional’s choice, meaning that your skill will make a significant difference in terms of quality of the coffee. It’s a great gift for someone who’s a coffee aficionado or wants to become one, but it isn’t really for amateurs. Most of the problems with Caffellisimo come from the design (which is the exact thing that makes it attractive). It gets clogged a lot especially if you use a finer grind and it’s quite hard to clean because of its compact built. Two layers of filters, for instance, couldn’t be separated making the easy to carry around and hard to clean. The best thing about this coffee maker is that it fulfills the need of casual coffee drinkers and professionals alike. The materials from which it’s made will guarantee that you could use it basically forever. The fine filters could be difficult to clean once they get clogged. It’s not the best choice for those who like strong coffee. Java Presse is another small, metal coffee maker. The stainless steel it’s made from would work equally well in a fancy kitchen or during a camping trip. It practically can’t break and you can use it over a thermos or a mug of your own. It’s also one of the quickest coffee makers out there. There’s absolutely no need for wires, pitchers, carafes or anything else, but a mug to drink for. With a slow pour you could have the coffee ready in 90 seconds and since the Presse is the only thing you need to clean – it to won’t take much longer. It’s inexpensive and comes with a money back guarantee, meaning that anyone could try it and change it if it doesn’t suit their needs, but it will meet the needs of most coffee maker regardless of their skill level. There are very few downsides to this coffee maker, except the fact that it gets jammed if you use too fine grinds, but that’s the issue with all metal coffee makers alike. The fact that you can pour the coffee directly into a thermos is really useful. It’s so simple to use that anyone can do it. It can sometimes clog due to the fine filter it has. It can’t be used for larger batches. This set is a bit larger and it comes with its own glass carafe with a glass handle. This doesn’t make it the best solution for traveling or even keeping on the edge of the table. This one should be confined to the kitchen, where it will look great. It will give you a hot cup of coffee pretty quick in a matter of minutes, but it’s important to define what a cup is. You will need two of these cups to fill one regular-sized. It’s a perfect solution if you’re only making one coffee for yourself in the morning but it won’t do for a big group. The set really showcases your skills giving you a better and richer coffee taste. The filter is laser cut making the flavor that much more intense. It’s the best solution for those who are no longer amateurs and want to enjoy coffees from all over the world and notice the difference. 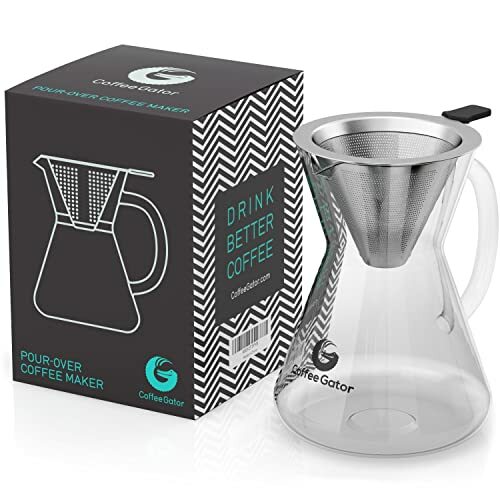 Most users had problems with the size of the cup, but that’s just something you need to get used to, and the filter sometimes creates an air lock with the glass pitcher, but you can just lift it off for a bit. The size of the set is just perfect. It’s fast for both use and cleaning. The cup lines on the carafe aren’t precise. The filter sometimes creates an airlock that doesn’t allow the water to flow. It’s pretty hard to get the verdict out on the best pour over coffee maker because it’s a matter of personal taste and preferences. However, I can point out a few things that help me decide. It’s important to know that I’m making a recommendation that would suit even someone who isn’t an experience in the field as I am. Look for the design that allows ease of use especially if you’re a novice. After a while, you’ll be making coffee with your eyes closed, but it’s good to have something simple to lean on until you do. Before you decide on the type and the size of a filter, make sure you know what kind of coffee you like and how important is the strong taste for you, because this isn’t something that could be changed if the filter is metal. which is a large size coffee maker?